This gold coin was found in a Salvation Army kettle in Urbandale. A big chunk of change is discovered in a Salvation Army kettle in central Iowa. Salvation Army officials report they were sorting through bills from a red kettle that was hanging at a Hy-Vee in Urbandale this weekend when they were surprised to find a valuable piece of metal wrapped inside a five-dollar bill. 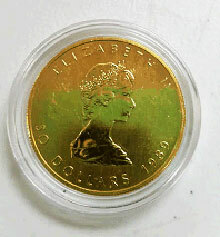 Someone donated a one ounce Canadian gold coin. The Salvation Army reports it’s worth over $1,200.